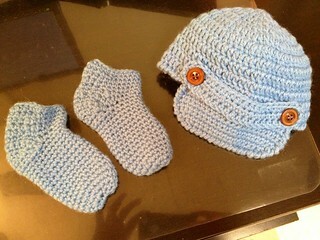 I’ve just completed two newsboy caps for my niece’s newborn son, and a matching pair of socks. 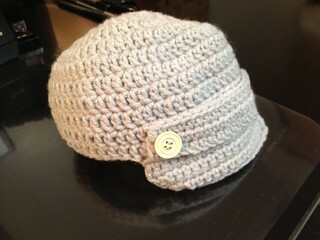 I modified the pattern by adding a row or two to make the hat a little larger to adjust the gauge for size. Overall, the pattern is well written and the results are just plain cute! » This entry was posted on Saturday, September 29th, 2012 at 6:29 pm	and is filed under baby, Crochet, FO, Socks. You can follow comments with RSS 2.0 feed. So cute! 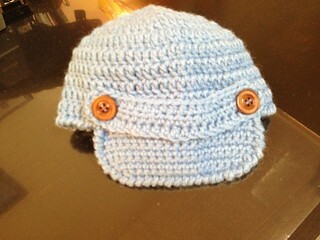 He is going to look like a little man in that hat.